Knopf Books for Young Readers, 9780399553295, 40pp. 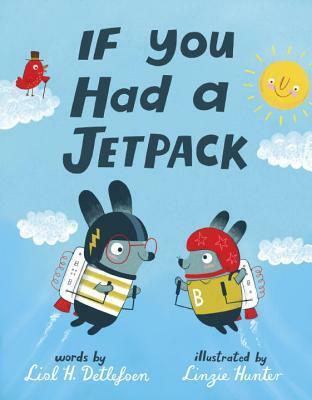 A fun and creative answer to the question "what would YOU do if you had a jetpack?" perfect for fans of Boy and Bot and How to Train a Train. Having a jetpack is fun--if you know what to do with one. Lisl H. Detlefsen lives on a cranberry marsh in central Wisconsin with her husband and two young sons. She is the author of Time for Cranberries, a picture book published by Roaring Brook (Fall 2015). Visit her on Twitter @lislhd or at lislhdbooks.com. Linzie Hunter's hand-lettering and illustrations have appeared in books, magazines and advertising campaigns internationally. Her client list includes: Nike, the BBC, Marks and Spencer, Hallmark, Harper Collins, Random House, The Guardian, Time Magazine and The Wall Street Journal. Learn more about Linzie on instagram @linziehunter or on her website at LinzieHunter.co.uk.